I just ran both of my books as freebies via the KDP Select program. The results? Outstanding. My original plan was to have The Five Elements go free for 1 day, then do the same with The Hall of the Wood on Day 2. I changed my mind when I saw how well TFE was doing on that first day, extending TFE's free promotion into Day 2 so that both eBooks were free on that second day. It also climbed as high as #136 in the overall Top 1000 Free category! A 3rd day free and maybe it would have broken the Top 100. 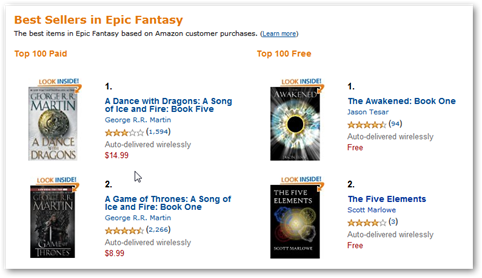 Something interesting happened to TFE on Day 2 around noon which I believe contributed to the increased download number: First, it made its way onto the Top 100 in Free Epic Fantasy (eventually climbing as high as #2 as shown). Second, it made its way onto the Top 100 Free Fantasy (overall) list, climbing as high as #36. From around noon on until I stopped checking later that night, it was getting about 100 downloads/hour. HOTW didn't do as well. I do have a theory on that, though. HOTW was previously free for almost the entire month of December (I had it listed at $0.00 on Smashwords and Amazon noticed). During that time, it was getting 200 downloads/day until it finally went back to non-free. There's no way of telling if this was the reason I only saw 300 downloads for it. Maybe it takes a day to get things primed and another to really hit it big. Results for TFE would seem to support this. It's great to see this kind of "interest" (yeah, I know, a lot of people probably just downloaded because it was free; who knows if they'll ever read it). But let's face facts: free doesn't pay the bills, and so no one was more interested than I to see how or if this would turn into any real sales. Turns out, it did. Before I jump into those numbers, though, let's take a look at the ancillary effects of listing a Kindle eBook for free. 1.) Free makes your eBook show up on more "Customers Who Bought This Item Also Bought" lists. Before going free, TFE had about 20 or so titles in its own list. Once it came off free, it had 100. While there isn't a direct, one-to-one link between all books, having more items in your list would seem to mean your eBook will get listed on the other side more often. HOTW already had a lot of links because it was free for most of December. 2.) Free makes your eBook show up on more Top 100 listings. TFE is now appearing on 3 different Top 100 lists. Showing up on these lists makes it easier for readers to find your book. If you're not on a list, you're relying on Amazon's search, or customers to just blindly stumble upon your eBook. 3.) Free (might) get you more reviews. I don't know if this is true or not. I haven't see any one who said, "I got your book for free and now I'm writing a review." But it stands to reason that the more people who have your book, the more likely you are to get a review out of some of those readers. Now, on to some sales numbers! The free promotion ended on 1/25, so 1/26 was the first day both eBooks were priced at $0.99. There seems to be a notion that "Day 3" is the highest volume day when an eBook comes off a KDP promotion. My data supports this, though with the 27-29 being Friday – Sunday, I think that also had something to do with it. The bottom line here is that with these numbers I'm not going to be able to quit my day job anytime soon. But considering neither book was getting much in sales or getting noticed prior to the KDP promotion, I consider this a big step forward. 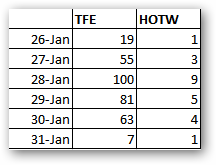 As I write this, sales volume has dropped off a lot, but I'm also not seeing any huge drops in the Top 100 listings (for TFE, in particular). This makes me think the middle of the week is just a slow period for sales. Either that, or the "KDP effect" lasts only for a few days. I'll know more as I continue to track sales and, eventually, offer both eBooks for free again. I go out on a limb and make some predictions for the New Year.